Linda Tran was a high school junior when she came to PUENTE in 2017 for help in applying to college. Linda enrolled in SAT Prep classes at PUENTE, which have been offered for over 20 years in partnership with Kaplan, Inc. at no cost to students. 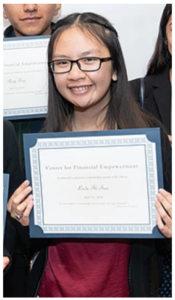 Linda also attended a financial aid workshop at PUENTE, which led to her applying to and receiving a 2018 Center for Financial Empowerment Award. Funded by SCE Federal Credit Union, the award is given to youth from under-served areas who show exceptional leadership and community involvement. Now a first-generation college student in the United States, Linda hopes to complete a major in either public health or cognitive science at UC Berkeley. This January, Linda came back to PUENTE to share her story with current College Access students.